Discussion in 'Science' started by HereWeGoAgain, Apr 1, 2019. The complexities and logistics behind this idea make it unlikely at best. The effort, resources and mental effort is better spent on Solar in Space and microwave transmission. The part I find most fascinating about the Solar Space Microwave system is that was one of Nicola Tesla's original concepts for the distribution of electricity. He wasted most of his fortune trying to figure out how to make it happen. He was way ahead of his time. politicalcenter and tecoyah like this. Tesla was a genius and this is but another use of his massive contributions to the advancement of human progress and technology. Space Solar makes great sense and the unlimited energy supply far exceeds the cost of implementation. It can also be done relatively quickly with current technology. politicalcenter and Derideo_Te like this. That does the beg the question as to why it is not being implemented? Launching satellites is easy enough and nothing in the Type 3 would be difficult to build. Building a ground receiving station is also straightforward and just requires funding and approval. Give it another five years or so. Times they be a changin'. Right now however we are better off building solar on the ground. My understanding is that you need thicker cables with higher voltages. Why not just use lower voltages instead? Insulators are primarily used to prevent grounding shorts as far as I know. With the bulk of the tether suspended way above the ground the only insulators would be needed at the end nearest the ground. The triangular frames can be all be made with lightweight ceramic insulators bonded into carbon fiber frames. 1. As the voltage (electrical pressure) increases, the insulation requirements become greater. 2. As the current (electron flow) increases, the diameter and weight of the conductor must be greater. The above are 2 different considerations. Let's talk about insulation first. Realize that the amount of current needed does not affect the insulation requirements - the insulation requirements come from the voltage. Let's discuss electrical conductors that will be in close proximity to the other conductors of the circuit, such as in a multi-conductor cable or in an electrical conduit, or even multiple conductors in an FEG tether. Low voltages in the range of 120v to 600v that we utilize in homes and office buildings and such don't require much insulation. "Thermoplastic" type insulation of less that 1/8" thick easily contains the electrical pressure, or voltage. Simple stuff and no problems. However, as voltages increase, the insulation becomes more complicated. This is because the electrical pressure becomes great enough to ionize the insulation and air around the conductor. And ions become conductors which negate the insulating properties and the system fails due to "short circuits" or "ground faults." A typical 12 KV insulated conductor requires several layers. There will be a semi-conductor layer, a shielding layer, and then an outer insulating layer. The thickness of the insulation may be 3/4 of an inch or more. This is an attempt to lower the abrupt change from 12KV to zero KV at the conductor/insulator boundary. Terminations of the conductor to utilization equipment also become problematic and great care must be taken to relieve the high electrical pressure differences. Extend this further to really high voltages, for example, 100,000 volts and higher, and it is quite difficult to insulate these conductors with thermoplastic or rubber or anything else so they can be in close proximity to each other. The solution is to separate the individual conductors and use the air as insulation. If you look at the conductors on transmission line towers, you will see that the conductors may be 30 or 40 feet apart from each other. The conductors are bare metal with no insulation. Of course, the cables must be separated from the towers since the towers are conductive, and they do this with the ceramic insulators that I showed you in a photo above. These ceramic insulators may be 10 or more feet long depending on voltage level. 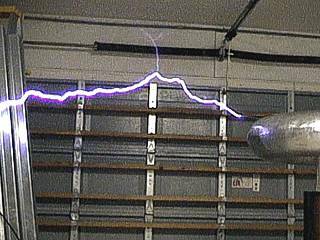 The picture below shows a high voltage Tesla coil sending an electrical arc through the air. I am not sure what the actual voltage is, but from reading the info, I infer that it was greater than 400,000 volts. This demonstrates where the problems arise with high voltage. This arcing is the limiting factor with respect to the voltage of electromagnetic generators and motors and other "utilization" equipment. Now let's talk about current. As the current increases, the cross-sectional area of the conductor must be larger. This has nothing to do with the voltage level. Small currents can use small conductors, for example, a 10 amp hair driver may have a power cord with copper conductors that are 1/16 inch in diameter. On the other hand, a large industrial machine may require 400 amps, and the copper conductor diameter will be roughly 3/4 inch in diameter. But if we transmit 4 gigawatts of power at 500,000 volts, the current would only have to be 8,000 amps. This would only require 20 of the 3/4 inch copper conductors. So we could use less copper, but now we have insulation issues and that becomes the limiting factor. Hope that makes sense. To lessen the weight of the tether/conductor assembly, we would need to transmit the power using high voltages which results in lower currents. This results in less conductor material needed and hence less weight. Concerning "ground"... We not only need to insulate electrical conductors from ground, we also must insulate them from each other. The simplest circuits require two conductors of opposite polarities. The insulation requirements way up in the air are the same as close to the ground. BuckyBadger and Thought Criminal like this. View attachment 85349 What could possibly go wrong? Yes, things could go wrong. 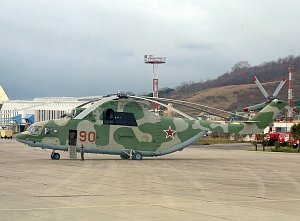 A "helicopter" design that relies on multiple sets of blades for both lift and generator rotation would probably crash if one of the turbines failed. A fixed wing design may fair better. The diagram below represents the vectors. Just so we have somewhere to start, let's use a 45 degree angle between the tether and the ground and the FEG at 5 miles altitude. Tether will be 7 miles long. Concerning the DRAG calculation: It isn't a trivial matter to spin a huge generator. What is the DRAG needed per GigaWatt of power? I can tell you that it would take 1,340,000 Horsepower for every GigaWatt of power. I am not smart enough to know how to convert the horsepower to the DRAG in pounds. Maybe someone skilled in physics can do that for us. 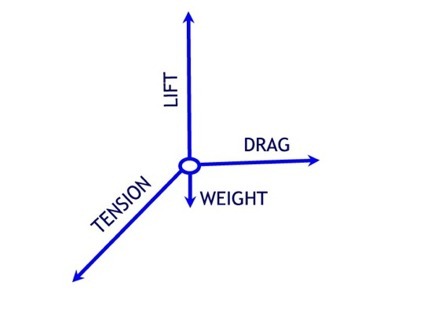 Once we calculate the DRAG, we can calculate the LIFT needed by adding the WEIGHT to the DRAG. That is going to be a huge force and the wing(s), whether rotating or fixed, will necessarily be large. Tether will be 5.77 miles long. In this scenario, the FEG will be supplying more of its energy input to LIFT rather than turning the generator(s). Wings need to be even larger than in Scenario 1. Tether will be 10 miles long. So, the LIFT is lower and more of the energy goes into turning the generator(s). The wings can be smaller. There is less tension on the tether. But the tether is much longer. The FEG would be 8.66 miles horizontally from where the tether is anchored. Interesting. Can someone do the drag calcs for a 1 MW flying gen? Copper is over 2.00 a pound U.S.
That is good news. When this giant contraption crashes and burns, we can gather up the copper and sell it (cha-ching) at the scrap yard! But to be real, the cost of the copper is going to be a very small percentage of the overall cost. Thank you for the detailed response. I have been giving this some more thought and then it occurred to me that @tecoyah has the solution to wire transmission problem already figured out for us. Instead of transmission wires why not use the same microwave transmitters that they would use from space on the FEG's? This eliminates the need for wires along the tether which means that it can be made from much lighter materials instead. With a lighter tether system the FEG itself can carry more generators and there could be as many microwave transmitters as are needed to send all of the power. Yes, the FEG is not as stable as a satellite in geostationary orbit but we already have the gyro technology to stabilize cameras on helicopters so adapting those to a microwave transmitter would be simple enough. Another advantage of eliminating the wires is that now the FEG tether can be attached to a winch which would make retrieving it so much simpler. A rail gun launcher would eliminate the need for a take off strip. A hybrid system that takes advantage of the best of various technologies would also act as a justification for launching the satellites since the ground based microwave receiving stations would already exist for the FEG's. Now there would be multiple sources of power all coming in to one point and acting as backups for each other. That isn't practical at this time. That is probably at least 50 years off at best. And there are dramatically more complex problems, not to mention the potential for a beam running wild, with transmitting a high-energy beam from space. The key to real energy solutions is understanding what is science, and what is science fiction. For example, we've been promised that fusion power is 50 years off, for 50 years. And it's still 50 years off at best. One day, perhaps, but that is not a solution on the table because the technology doesn't exist. Transmitting high-energy beams from space is in the same class. That is more on par with space elevators. That said, I just did a quick calculation and find that the wire may cost several hundred $million. That is assuming 1500 KCMIL and two conductors. Aluminum wire of that size weights about 1.4 lbs per foot. So 50,000 feet of aluminum wire is only 70,000 pounds. The LM9000 is an aeroderivative gas turbine available in two options; the LM9000 without water augmentation outputting 66 MW (89,000 hp) at a 42.4% efficiency before cogeneration, and the LM9000 with water augmentation outputting 75 MW (101,000 hp) at a 42.7% efficiency before cogeneration. The engine's 33:1 pressure ratio comes from a 4 stage low pressure compressor followed by a 9 stage high pressure compressor, driven by a 2 stage high pressure turbine and a 1 stage low pressure turbine, powering a 4 stage Free Turbine. So the wings on a commercial aircraft are already operating with about 15% of a GW load from the engines. And ultimately the wings are lifting up to 800,000 pounds. So with the mechanics of this are already within the envelope of aircraft design. This has a maximum takeoff weight of 42 tons. 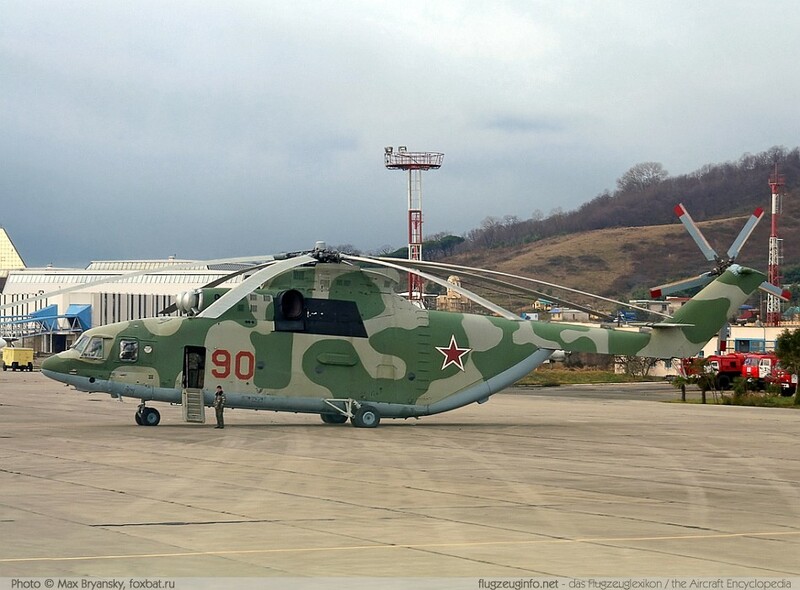 - 84,000 pounds - and has a rotor diameter of 104 feet. There is a nightmare waiting to happen. A nightmare, impractical and dare I say: stupid. Yes, that was the point a long time ago. For someone so critical you take quite a long time to catch up. Did you see my post citing the 1-million volt lines in use for power? Will you be apologizing now or later? Well that means nothing. You aren't an engineer. So your opinion means nothing. And even then, in science and engineering, opinions never do mean anything. My opinion means just as much as yours and carries just as much weight. After reading most posts and responses here, I have determined your "conclusions" and opinions are literally some of the worst, that even an average (or below average) engineer can refute. Do you really not get the difference between transmission lines and generator windings? BuckyBadger and roorooroo like this. Yes, that was the point a long time ago. For someone so critical you take quite a long time to catch up. Did you see my post citing the 1-million volt lines in use for power? Will you be apologizing now or later? Apologizing? For what? I will continue to point out possible errors or wild claims when I see them - in an effort to keep the topic within the bounds of reason. Re: P = I x E : Did you not catch the point that Derideo_Te had asked some questions about voltage and current and power and I was re-explaining things to him? Critical? Pointing out mistaken claims of 500,000v and 1,000,000v generators isn't being critical. Being skeptical about the magnitude of electrical energy that can be created by a single FEG isn't being critical. Do you have a problem with someone being skeptical? A real scientist wouldn't. If the skepticism is misplaced, show us that the skepticism is wrong. Do you have a problem with people questioning your claims? A real scientist wouldn't. Concerning 1,000,000 volt transmission lines, see Post #172. Actually, I will apologize for hurting your feelings. However, if you look back through this thread, and look at your rude demeanor when replying to those who question your assertions, you would realize that you don't take criticism well. I will try to make time tomorrow to add to the topic at hand. I hope that you can settle down and add to the discussion instead of sniping and trolling. Seriously, at this point, get over it, and add to the discussion. So to answer your question there are several parts that need to be addressed. The first is take off and reaching the jet stream. The tether cable could provide electricity to run the generators as motors in order to achieve the desired altitude. Once in the jet stream the FEG needs to essentially have enough power from the rear pusher propellers to remain in one constant position while the forward turbine blades turn the generators to make electricity. Optimizing the lift/drag from the wing would take advantage of the tilt feature and thereby ensure that least amount of power would be consumed by the motors while also reducing the strain on the tether. The power is coming from the tether holding the vehicle in place against the wind. (With a windmill, the power comes from bolting down the windmill against the power of the wind.) If you use a motor for that, it starts being an attempt at a perpetual motion machine. I think the tether has to hold the weight of the tether (with its lighting, power cable, etc. ), the force of the wind on the tether, the force of the wind on the control surfaces and generator/control framework, and the power production forces on the wind turbine blades (accounting for the tether pulling at an angle). Because of the magnitude of forces involved, a single FEG producing in excess of 1 gigawatt seems physically unlikely. Also, the complexities of flying this unit up to the jet stream while towing the tether, then positioning itself into the wind, then switching from propulsion mode to electrical generating mode seems highly unlikely at best. The following shows some companies that have various designs for extracting electrical energy from the wind. Joby, Ampyx, Sky Windpower, and Makani all made predictions that they would have 1 MW FEGs in operation by 2013 to 2014. None have accomplished that and here we are in 2019. Magenn apparently went out of business around 2015. Makani appears to be the most successful and apparently has a prototype in Hawaii that is 600KW. This is a kite system with the generators and electrical equipment on the ground, not flying up in the air. Here is an article with concerns about the claims made by Sky Windpower. Considering that individual land-based wind turbines produce 1.5 MW up to 8 MW, the FEG concept is struggling to be relevant. This isn't saying the concept on a large scale is infeasible, but the hurdles seem high indeed.